Thursday night saw five different Russian NHL’ers light the lamp for their respective teams. While they were all important to the teams involved, one players performance stood slightly higher than the rest. Heading into Thursday’s match-up against the Rangers, Evgeni Malkin and the Penguins were coming off an embarrassing loss at the hands of the Islanders in the ever competitive Atlantic Division. Just 1:27 into the game, Simon Despres found Malkin with a pass near the far right circle which the 26-year-old center rocketed past Henrik Lundqvist’s 5-hole. Having spent time in Toronto, Pittsburgh, Los Angeles, and Carolina the Poni Express was routed to New Jersey Friday night as the Hurricanes dealt Alexei Ponikarovsky to the Devils for fourth-round draft pick and an AHLer. The 31-year-old Kiev native has become something of a journeyman going to his fourth team since 2010. There is much to be said about the current state of the New Jersey Devils as it appears the franchise is headed for their first season without a playoff berth in 13 years. With the firing of rookie coach John Maclean just days ago, the lack of defense in front of veteran Martin Brodeur and the team’s new poster boy for it’s misery, Ilya Kovalchuk, the Devils have become the laughingstock of the NHL. On the same day the Los Angeles Kings lost a Russian-speaking player they gained another by signing free agent and Ukrainian-born Alexei Ponikarovsky to a one-year deal worth $3 million. Known as Poni, the 30-year-old winger who spent most of his career with the Toronto Maple Leafs before being traded to the Pittsburgh Penguins last year comes to LA with 266 points in 493 games. Another year, another busy trade deadline period for Ray Shero and the Pittsburgh Penguins. A day after trading a second round pick in the upcoming draft to Florida for defenseman Jordan Leopold, Shero was at it again, this time with offense in mind. After the conclusion of Tuesday night’s victory over the Ryan Miller-less Buffalo Sabres, the Penguins announced the addition of Toronto left wing Alexei Ponikarovsky. Veteran defenseman Martin Skoula and 21-year-old prospect Luca Caputi will be packing their bags and heading north to Canada. The initial thought was that Maple Leafs’ General Manager Brian Burke wanted at least a second round pick for the Ukraine Train but as the Penguins had already spend theirs on defense, Shero chose not to hand out a first rounder. Caputi makes up the brunt of the deal, and Skoula was essentially the 8th man on the Pittsburgh blue line and needed to be moved to get under the salary cap. But enough of the blabber. 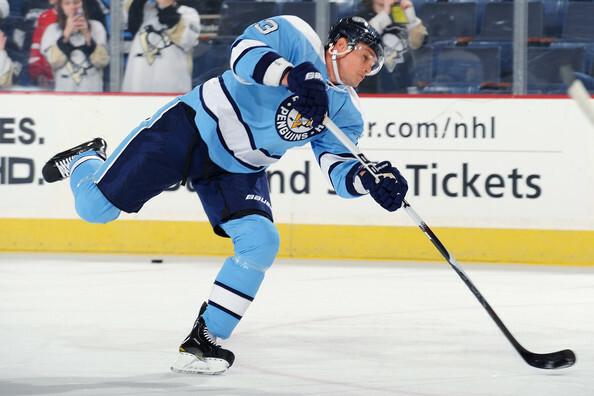 The Penguins reeled in a mighty fine winger that will most likely be used on Evgeni Malkin’s left wing. The Maple Leafs received a talented prospect that only further aids their youth movement. For a moment, let’s think about how this now effects the Eastern Conference playoff race and the Penguins for the rest of the season. First, the negatives. What are the cons about the trade? First, the Penguins are obviously giving up a very talented young player that surely had a future in the organization. Along with Eric Tangradi, Caputi was considered the best offensive prospect in Wilkes-Barre/Scranton and played good hockey in his time with the senior club. The Penguins have now added yet another soon-to-be unrestricted free agent, bringing the total up to eight players who will complete their contracts in July. The loss of Skoula, while may not seem extremely large, does have implications on the playoff race. When they won the Cup last year, there were eight NHL-caliber defensemen on the roster. Now with the loss of Skoula, that number is cut to seven, with the odd man out currently being Jay McKee. Of course, there’s interest in him as well and he may not even be around come 3pm on Wednesday. The trade has little negative impact on the short term, as Caputi wasn’t likely to play again for the Penguins this year and Skoula was a healthy scratch nearly every night. But in the long run, the true deciding points will be if Shero can resign Ponikarovsky this offseason and how good of a player does Caputi eventually become? But there are two sides to every story, so let’s look at the other side. What are some pros? At 6’4″ and 220-some pounds, Ponikarovsky brings both immense size and skill that the Penguins have not had on the wings since Upper St. Clair native Ryan Malone left in the summer of 2008. The big winger is superb and playing down low and getting to the front of the net. He also represents a finisher that will be a major asset to the success of Malkin over the last month. Truth be told, almost anyone would have served as an improvement to what the Ruslan Fedotenko has provided this season (yes, he had a good game against Buffalo). But Ponikarovsky is not only a guy that has scored 20-plus goals playing for bad teams but a player that can also dish the puck. But put aside his scoring for a minute. The biggest reason that Shero liked him enough to make a trade over several arguably more gifted wingers, example Ray Whitney, is the fact that Ponikarovsky also plays very solid two-way hockey, which is necessary for a team that attacks like the Penguins do. That doesn’t mean we’ll see him on the penalty kill or on a checking line any time soon, but it always helps to have a guy who can back-check well if a turnover is committed. In the salary cap era, numbers also have to be considered. For the remainder of the season, Ponikarovsky’s cap hit is at $447,000. For a player of his caliber, extremely reasonable. In terms of losing Caputi, remember a guy by the name of Angelo Esposito? A piece of the infamous Marian Hossa trade, Esposito had tons of promise as a young player, as many felt that he could have been a Top Five draft pick but fell to the Penguins. But in hindsight, Esposito has still never played an NHL game and while it’s still too early to call him a complete bust, he’s certainly closer to the bust than a boom. Does Ponikarovsky have the ability to push the Penguins over the top? He absolutely adds another dimension to the team that wasn’t there earlier and his presence should be worth it’s weight in gold to Malkin. Time will tell. The Ukraine Train should make his Black and Vegas Gold debut against the New York Rangers on Thursday. On Friday night Alexander Ovechkin recorded five points against the Toronto Maple Leafs to lead the Washington Capitals to a 6-1 victory. Captain Ovechkin would need just 49 seconds to get started beating Vesa Toskala glove side for his 29th goal of the season. Ovechkin would add an assist on the next four goals for a career-high. All four would be primary assists as the Capitals most exciting player could not be stopped. Ovechkin now has a point in each of the Caps’ last five games and jumped into second place behind Henrik Sedin for tops in the NHL with 62. Andrei Markov’s 2009-10 season lasted only two and a half periods last night against the Toronto Maple Leafs as the veteran defenseman left the game after having his ankle tendon torn following a collision with goalie Carey Price’s skate. Markov had surgery following the game in Toronto and is expected to miss 3-4 months. While it’s a major loss for the Montreal Canadiens, it’s possibly a bigger loss for Team Russia who’s blue line is their Achilles heel. With only Sergei Gonchar as their top NHL d-man it looks like most of the help will be brought in from the KHL who already outnumber the NHLer’s 10 to 4. Last season Markov finished with 12 goals and 52 assists, and played in his second consecutive all-star game. Markov is in his final year of a 4-year contract.